“Stands out as one of the few [books] that doesn’t want to deify, dish the dirt or otherwise exploit the slain former Beatle.” — Stephen Holden, New York Times Book Review. “When history professor Jon Wiener made a Freedom of Information request to the federal government for the late John Lennon’s file, he could hardly have hoped for a richer payoff.” — Time magazine. 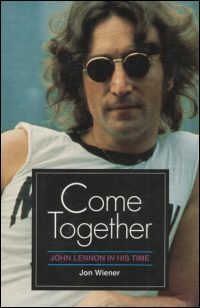 “By setting Lennon squarely within his era, Wiener’s study is exemplary. Lennon does not appear ‘larger than life,’ but rather as passionately involved in it.” — Michael S. Kimmel, Newsday.